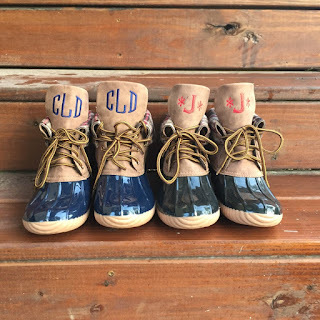 Who wouldn't LOVE these Monogrammed Plaid Short Duck Boots for $51.99 (Retail $78.99)? Duck boots are THE look for fall! Give yours some extra flair with a monogram! The classic duck boot design has a waterproof upper, water-resistant vegan leather shaft, soft plaid lining, and stretch-lacing. The durable, flexible outsole is ridged for added traction control.This ankle boot features a combination of faux leather and rubber and is made of all man-made materials.